Lunchtime, day one. Deano gives us a tour of the camper, pointing out how the cooker works, how the waste water tank is emptied, how to turn the gas on and off, and a million other things besides, ticking each of them off his checklist. The need to take care with the electrically operated roof is impressed upon us with particular emphasis – get the canvas caught in the wind while lowering it and the damage is costly. 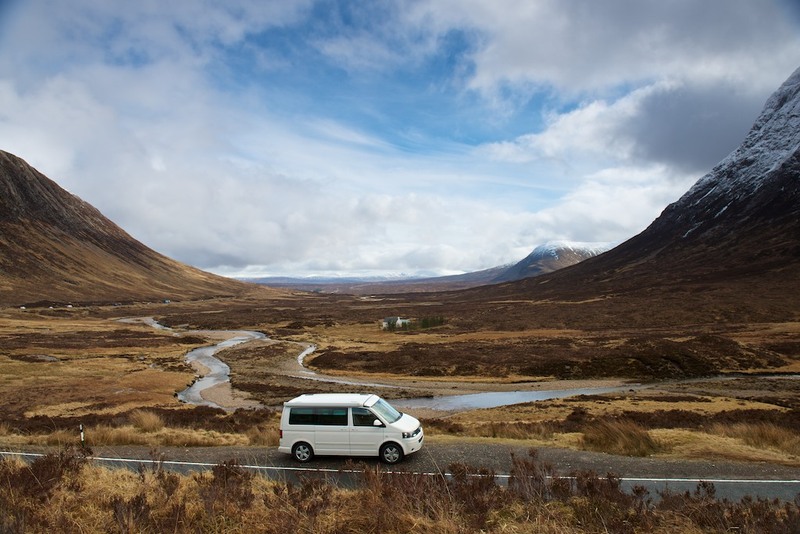 We must have taken it all in because once we’re on the road everything is simple and intuitive, with the possible exception of the ‘vanorack’ – an additional canvas jacket which can be draped over the vehicle in cold weather, and the chemical toilet. Yes, I know, but they were both available at no extra charge so we figured it was best to take them along and not use them rather than leave them behind and not have the choice. Our camper care crash course completed we head north from Bognor and seek out the M4, heading for the Severn bridge and up into Wales. The California is smooth and fast; it’s seven speed double clutch automatic gearbox makes accelerating fun and the elevated driving position would have you believe you’re doing 50 when in fact it’s 70. All good mile munching. In no time at all we figure out there’s armrests that can be folded down, and suddenly we’re two retired snowbirds, heading down the Florida coast. The straight roads run out after Abergavenny and we’re impressed by the California’s handling, which isn’t bad at all for a van. In an ideal world we’d like to see electronic air suspension taking a little more of the wallow out of corners, but there’s only so much you can do with traditional shocks and springs without making the ride too harsh. It’s getting dark by the time we come across Graig Wen in Snowdonia, so we pull in, park up, and put the kettle on. 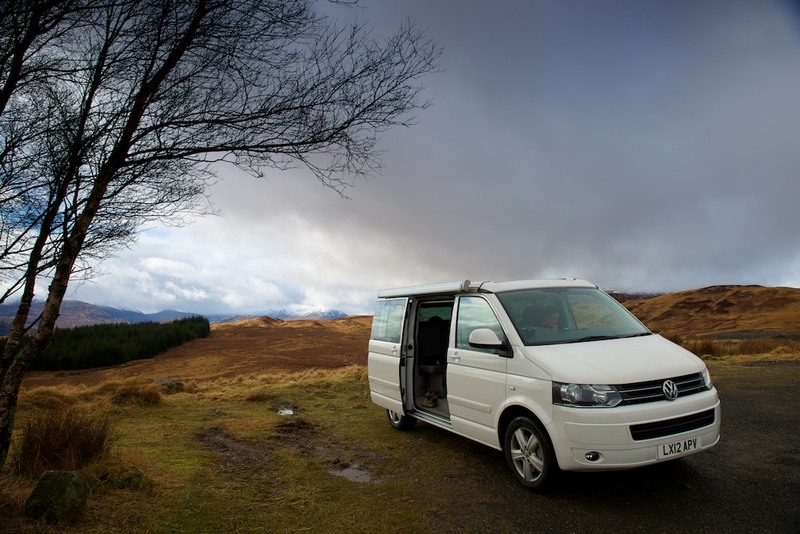 Transforming the VW from driving to camping mode is as simple as pressing a button by the rear-view mirror to raise the roof, pushing up the ceiling to create room to stand, and turning on the gas tap in one of the clever cupboards. It’s just two degrees outside, so after our tortellini and wine we elect to sleep downstairs rather than risking exposure in the roof tent. We needn’t have worried; another button press activates the diesel powered heater, which we decide to leave on just 30% overnight in case it doesn’t leave us enough fuel to get to the petrol station in the morning. For the next seven hours we were toasty and warm with just a thin duvet, and used no fuel whatsoever as far as we could tell. Game on! Day two dawned frosty and clear, so after a brief lie-in we brewed tea and scoffed cereal before continuing north to the Welsh coast. 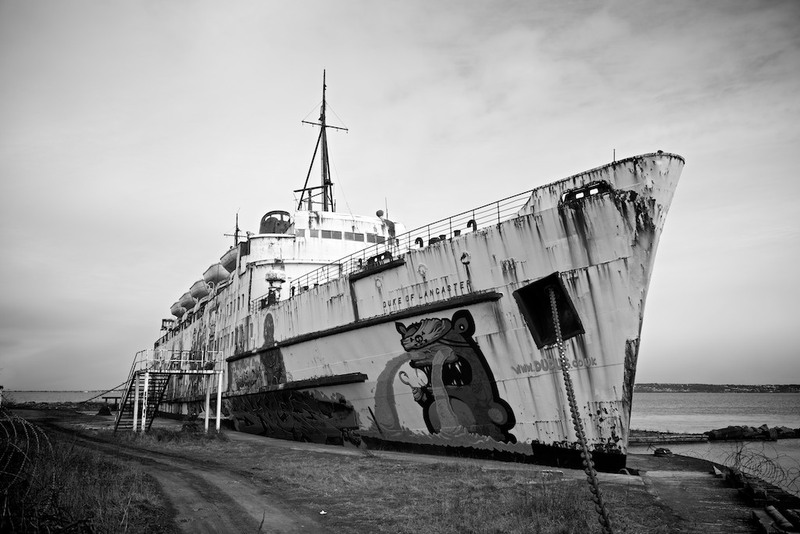 Our first stop was the Duke of Lancaster, otherwise known as the Mostyn Fun Ship: a vast liner now imprisoned in concrete following failed plans to transform it into an entertainment venue. Time was marching on and we had ambitious plans, so exploration efforts were restricted to a few exterior shots before moving on towards Liverpool, passing miles and miles of caravan holiday parks. Well and truly into the camper lifestyle, we’ve adopted the habit of using just the sliding side door to exit and leave the vehicle, changing into our slippers and leaving dirty boots in the footwell. I suppose it’s only a matter of time before we acquire some kind of terrier and start buying the Daily Mail. Liverpool was neater and outwardly a lot more prosperous than I expected, though nowhere near as twee as the Lake District. By now the weather had taken a turn for the worse, and flurries of snow added to the zero visibility on the higher peaks. With hopes of scenic vistas forgotten, we took the motorway up past Carlisle and to Glasgow, where we were treated to typical warm hospitality by our friends Andy and Nora. I could have been imagining it, but everybody seemed a lot more polite on the roads once we left England. Motorway drivers used lanes properly and showed a lot more regard for others, letting us pull out and overtake without the type of defensiveness one naturally slips into when driving down south, particularly around London. I don’t know, maybe we were just in holiday mode, but it made for a nice welcome. We bade a reluctant farewell to our friends the next morning and after filling up with the last of the cheap fuel at Tesco’s continued north, passing yet more caravan holiday parks, their countless identical carbuncles looking lost and forlorn out of season. Andy had kindly filled our Garmin with a few choice routes and waypoints so we’d see the best of Scotland, and his efforts certainly didn’t disappoint. We saw Rannoch Moor, resplendent in shafts of sunlight between fleeting rainclouds, Jimmy Saville’s old house – slightly less resplendent though freshly free from graffiti, and then our first ferry crossing at Corran. A quick gander at Castle Tioram is followed by our second ferry, this time from Mallaig to Skye. Unfortunately we can’t figure out how to lock the camper without engaging the alarm, and it screeches blue murder for the entire crossing. A quick glance at the manual later on reveals that there’s a button near the back of the driver’s seat (where else) that disables the motion sensors and should be used on ferry crossings. Several days later it occurs to me that our Audi might have a similar button, and sure enough there it is, the same button in the same place. Kudos to VAG for standardisation if nothing else. 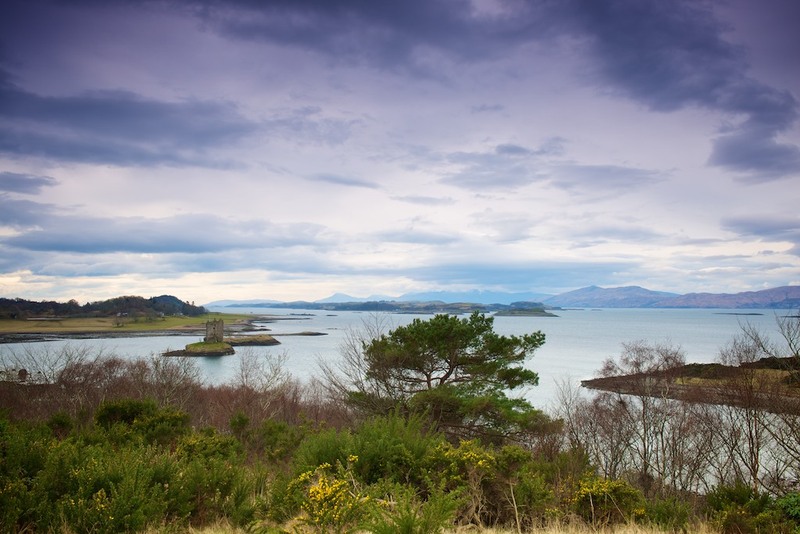 The roads on Skye are very small and wind along the coastline before disappearing into gently rolling hills covered in hairy oaks. In one of the occasional villages we see Jimmy Crankie’s da: a wee wizened fellow with orange hair and a tartan cap, not to mention a total nutter who’s touring Scotland on a Brompton. Again we’re late at the campsite and there’s nobody about, so we park up and gorge ourselves on chilli con carne and lemon cake before retiring upstairs. The temperature outside hovers around freezing and this time it’s a little colder with just a duvet despite the heater being on stage 4. It’s not really a problem, my preference would be for sleeping bags instead of a duvet as they tidy away easier, but it’s remarkable how much cooler the roof is over the downstairs bunk. Day 4 sees us leaving Skye after a quick lap and heading to Fort William, passing Eilean Donan Castle and the Commando memorial before installing ourselves at the Glen Nevis Caravan & Camping Park. With snowy peaks visible just across the road we crank the heater up to 50% and try our sleeping bags, only now it’s too warm at night. Go figure. Scotland lives up to expectations on the next day with torrential rain, so we aim south after picking up the obligatory souvenirs of shortbread and whisky. The seaside location I’d earmarked for a spot of wild camping turns out to be rather close to an air force base but we ignore the No Camping signs and spend an interesting evening being buffeted by gale force winds while eight foot waves lash the coast outside our window. Today the roof stays down. The scenery on the rest of our lap-o-Britain pales in comparison to Scotland, but Scarborough, Grimsby and Skegness lift our spirits in a way that only off-season seaside towns can. After a seemingly endless circumnavigation of the Wash we plot up at Deepdale Backpackers and celebrate with mussels in garlic and cream sauce, washed down with several pints of Oyster Catcher. You’ve got to hand it to Volkswagen – the California is solid gold. Our 180 BHP model really did drive like a large car thanks to it’s light steering and snappy DSG gearbox, but what really sets it apart from the rest of the pack is the way it’s been kitted out. VW have been making campers in-house for over 60 years now and that pedigree shows through in so many ways, from the clever do-it-all control panel to the integrated black-out blinds. The pop-up roof is a dream, the heater does it’s job with quiet, teutonic efficiency. Fridge, cooker, sink, picnic furniture hidden in the doors, a million cupboards and cubbyholes – all good. The only small criticism I have is that the front seats are a bit of a faff to turn around, requiring you to adjust the angle of the backrest, release the handbrake, and then jiggle them backwards and forwards while operating a lever to rotate them inwards. Get it wrong and and the adjustment knobs bash the chassis, which was already well marked in this respect. I’d also like to have seen a tad more leather or, at any rate, less beige used in the interior, but these are small detractors and shouldn’t stop you from appreciating the fuller package, which is very impressive indeed.